An excursion to the Istrian Peninsula was supposed to be the highlight of our first day in Croatia, but after a 13-hour flight to Venice and a long bus ride to Opatija, Croatia, our first stop, we overslept and woke up after 10:00am, so we missed the tour and the breakfast time at the hotel. We decided to walk around town to find a restaurant where we could get lunch. While walking the roadside, we ran into a couple from our tour bus, who told us about a promenade by the sea, but we continued to walk on the roadside to go to the town center. My travel companion and I had different expectations of this trip. I was just happy to see the beautiful mountain scenery on one side and the calm Adriatic sea on the other side with the beautiful clouds hanging over the mountains and the sea, and to capture the scenery in picture. My travel buddy, on the other hand, had high expectations about Croatian food. We took it easy and strolled through the town center, along the sea coast, before deciding where to eat. Most of the restaurants along the way seemed to be part of a hotel or resort. There was a seafood restaurant, but we did not see anybody eating there. Enjoying the beautiful scenery and taking pictures, we continued to stroll and found interesting buildings, museums and an old church. Finally, we saw a restaurant with a few local crowds - men smoking, older women and a young woman with a baby stroller and a dog. So we decided to have lunch there and sure enough, the food exceeded my travel companion's expectation. After lunch, we walked back to our hotel through the promenade lined with bars and cafes, there was hardly a crowd or tourists in the bars and cafes. The promenade ended at a water taxi station or a local port. We decided to take the water taxi to explore the other side of town, but there was no one at the port. Suddenly a man came out from what seemed to be a tourist office and asked if we wanted to “hire” a boat with a driver that would take us to another island. 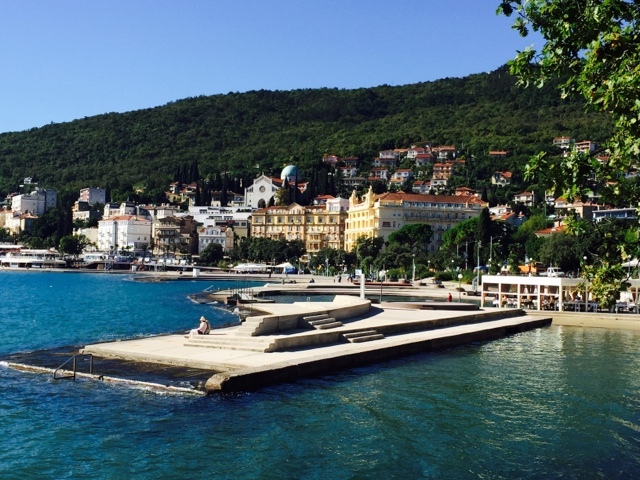 From the map, it did not look like an island, but we made an afternoon of it, exploring another part of Opatija. It was a three-hour trip. It was a lovely boat trip with beautiful mountain scenery and villas along the sea and of course the calm blue Adriatic Sea. After an hour of scenic boat ride, we got dropped off to explore the island/village (Mošćenička Draga). As we stepped off the boat, we saw four men and women with walking sticks and appeared to have just returned from hiking. We walked around the village and found small hotels and residential homes with lush gardens and fruit trees, and kiwis. We continued to walk the narrow road that leads to a hiking trail. Realizing that we did not have the proper hiking gear nor time for such activity, we returned and decided to have coffee and use the restroom facility at a tiny café instead. [And this is where the real story begins.] I was stuck in the restroom, I started to panic because we needed to walk back to the port and get to the boat by 4pm. Luckily, the staff at the café spoke English, and was very helpful. They tried everything they could to open the toilet door, but when all ideas were exhausted, they called the men in uniform (I wasn’t sure if they were park rangers) to help. I thought one of the men was going to kick the door open, but instead he gave me instructions on how to turn the key inside the toilet in a very precise way. Why on earth the key was inside the restroom? Well, the lesson learned is that getting lost is a good way of exploring a new place if you have a few days to spend and learn their way of doing things. My first impression of Croatia is all positive though - Croatians are tourist oriented, they're very accommodating and friendly; the food is superb and the coffee is great; and the scenery is a photographer's dream.